With its enviable views of the city, its own swimming pool, and generously-sized spaces, this penthouse already had the makings of a dream home. But when husband-and-wife team Kelvin and Karen Gan of KGID were given free reign by the apartment’s owners to transform the space into a warm, inviting home, they took the chance to inject a refreshing twist of their signature Art Deco style to the interiors. “After seeing our previous works, the owners left the design and furniture selection to us,” explains Kelvin. The designers placed emphasis on a mix of energetic shapes and refined details to create an elegant, inviting environment. One of the apartment’s star features is its double-volume living and dining room, a striking space filled with natural light. 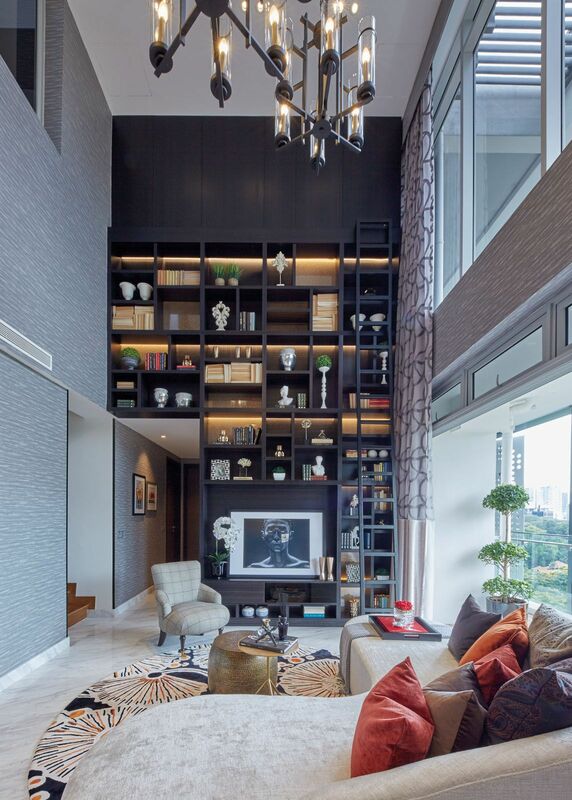 Flanked by a dramatic six-metre-high ceiling wall cabinet featuring eclectic objets d’art, books and artworks, the space confidently merges plush living with a sense of cultural refinement. “Modern elegance has always appealed to us; this time, we’ve injected fashion-inspired fabrics into the design,” says Karen. These stylish accents include bedroom headboards with detailing and materials that take a leaf from the luxury fashion brands, as well as a chic array of wall coverings in leather and fabrics. Step into the master bedroom and this fashion-forward style can also be seen in the design of its walk-in closet. Open shelf displays and glass finishes create a striking gallery-like setting for the owners to display their coveted items. It’s a captivating feature, and one that showcases the designers’ keen intuition for space planning. Their space planning expertise would come further into play, as the apartment came with its own tricky spatial challenges. The owners felt that there were too many outdoor terraces; take for instance, one of the bedrooms on the lower floor which didn’t have its own bathroom, yet came attached with two balconies. “Additionally, although the upper roof terrace came with a pool, the space was too open. The owners did not know how to make the space useful for them,” shares Kelvin. The design duo turned these spatial challenges into some of the apartment’s most surprising and attractive spaces, while embracing the great outdoors. For the aforementioned bedroom, KGID converted one balcony into an outdoor bathroom, complete with sliding aluminum doors for privacy. Another challenge was the reconfiguration of the master bedroom, which also came with two huge balconies. The designers chose to transform one of the balconies to use it as a study, while the second balcony was split into a golf putting area for the husband, and a reading lounge and yoga space for the wife. At the rooftop terrace, the designers have elevated the space into an entertainment arena marrying the best of both indoor and outdoor functions, with the captivating city backdrop offering a feeling of a much larger space. The terrace has been cleverly sectioned into different zones. An intimate lounge area is accented by a black-and-white printed carpet and rattan seating; the middle zone forms an inviting dining area highlighted with warm woods, while the bar at the far end sets the tone with its dark-tiled counter. The designers have also included a games area on the outdoor mezzanine where guests can step in for a game of darts or a spot of pool.